Eight hundred years ago, teenager Laurentius Loricatus accidentally killed a man in Italy. He then headed to a cave where he lived for 34 years, whipping himself to atone for his sins. Today, his story lives in the Vatican Secret Archives, on a piece of parchment covered in purple spots. 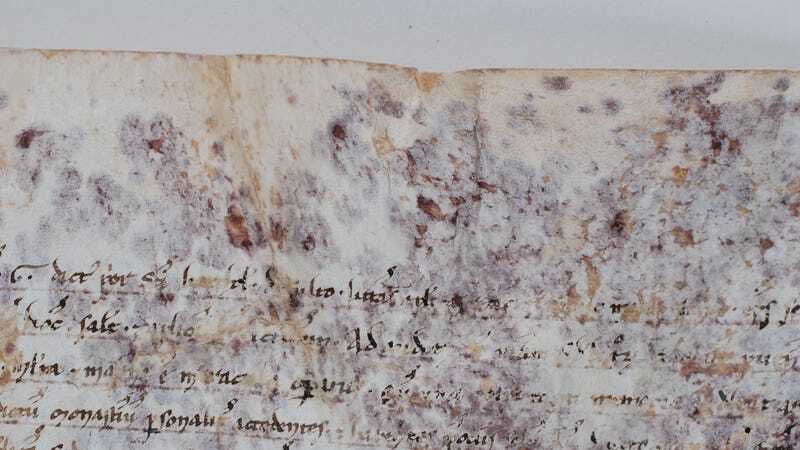 This kind of damage is common on ancient parchment—but why? What causes it? A team of Italian researchers interested in better understanding the ancient text decided to identify the microbes responsible for the splotching, and applied brand new techniques in order to do so. The researchers probably couldn’t have guessed some of the culprits. So, how did the splotches form? This parchment came from goat skin, usually preserved with salt brines. The brine could have acted as a culture for the purple microbes to begin sprouting. After salting, the parchment was stretched, shaved and scraped, leaving a salty inside and less salty outside; the salty collagen in the parchment would serve as the home to the bacterial colonies. The scrolls then could have moved into monasteries, the authors write, where they’d have been exposed to moisture and changing temperatures. Here, the purple bacteria would have flourished. As with any study, this one comes with limitations. Pinar pointed out that these methods only rely on a certain subset of DNA sequences, meaning there could be missing data. He pointed out another paper using a different sequencing method better avoided biases, and could do analyses beyond just the bacterial makeup. It’s also important to note you can’t always do a study like this—the authors got lucky that they could analyze pieces of the parchment that had broken off. Normally, they’d have to tear the parchment to do this kind of work. Still, the paper adds important evidence to support hypotheses of how these spots got there. Researcher Hector Morillas, from the University of the Basque Country in Spain, told Gizmodo he thought it was incredible work—he had no doubts about its methods and conclusions. What’s more, the team has offered new ways of understanding the aging of these scrolls for the future. Correction: This article previously misstated the salinity levels in the parchment. We’ve updated and are salty about the error.